Alles war super und sauber! La zone et l´appartement est calme, nous avons pu nous reposer après les journées de visite. Très bel appartement moderne et l´équipe d´AB accueillante. Bon séjour à Barcelone. This trendy, three bedroom apartment is found just next to Park Güell, one of Gaudí´s renowned attractions in Barcelona. The area in which you’ll find this stylish apartment is a lot less noisy than in the very city centre, however it still remains close enough for you reach all the main sights in a very short time. In this neighbourhood you will find lots of places to dine out, as well as plenty of local amenities like shops, cafés and supermarkets. The area has excellent access to the rest of the city via public transport. This modern apartment has three bedrooms, all with single beds. There is also a sofa bed, meaning the apartment can accommodate up to 8 people comfortably. This modern apartment comes fully furnished, with a fully equipped kitchen where you’ll find all of the utensils and appliances you´ll need to cook your favourite recipes, or even to try your hand at some Mediterranean-inspired treats. The living area has direct access to the balcony where you can take advantage of the Spanish sun. There are two bathrooms in the apartment, allowing for maximum comfort and privacy. 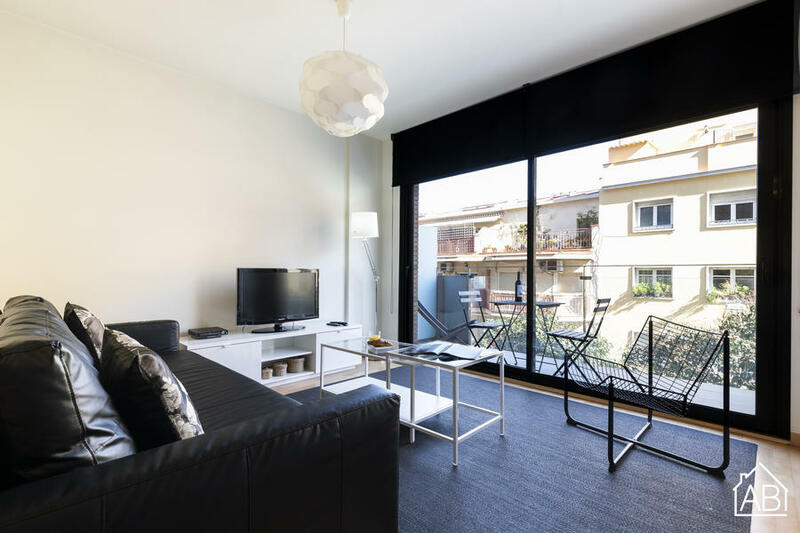 In this fantastic apartment, you’ll also find a TV with satellite, a DVD player, and an iPod dock, perfect for relaxing after a day exploring Barcelona. There is also a second TV in the ensuite bedroom. Wi-Fi is available too, making it easy to stay in touch with family and friends back home.